Winter Cold — it’s that time of year again! sounds of constant sniffling and coughing can be heard wherever you go. It’s that time of the year again when the common cold reigns and nobody seems to be able to escape its mighty grip. I thought I was smart by moving to a warmer country, but within days I had a runny nose and was getting through one pack of tissues a day. It seems that wherever you are, Autumn brings with it pumpkins, falling leaves and Halloween, but also a serious case of the sniffles. 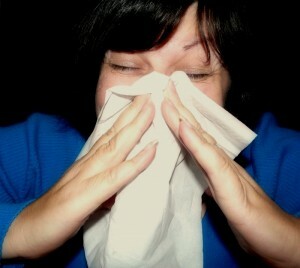 The bad news is that it is unlikely that we will ever be totally immune to the common cold. There are more than 200 viruses, each causing a different type of cold. This makes it difficult to develop effective vaccines. The rhinovirus and coronavirus are usually the ones that cause the most misery. Fortunately, most colds clear up by themselves in a week or two, but still this minor illness causes major discomfort and can be quite costly. Desperate times call for desperate measures and people end up spending a great deal of money on over-the-counter medicine that only offer temporary relief, but don’t actually attack the specific virus. You could go through life wearing a surgical mask, if you don’t mind strange looks on the streets or at the office. Though research has shown that wearing a mask might help to some degree however, it is only effective alongside with washing your hands regularly. While it’s impossible to live in a germ-free bubble, there are some ways to keep the cold away. The most common way of catching a cold is by inhaling the virus after a person sneezes or coughs or by touching a contaminated surface such as a door handle and then touching your face. You’ve probably heard this a million times, but the most effective way of keeping a cold at bay is washing your hands regularly and trying to keep your hands away from your face. As simple as this may sound, most people wash their hands for less than 10 seconds, which is half the recommended time. If you’re out of soap, use hand sanitizer. Also you might want to refrain from using an electric dryer for drying your hands and use a paper towel instead. Although the idea of sitting in your duvet cocoon during the winter months does sound appealing, if you want to avoid becoming a hermit in your own house you should really get moving. Exercise does not only do wonders for your physique, but it also helps strengthen your immune system. Eat chicken soup: Your granny was right, chicken soup is not only good for the soul, but it’s also a perfect remedy for treating a nasty cold. Research has shown that the broth reduces inflammation. Chicken soup also increases the mucus flow which can ease congestion. Also just like any other liquids it prevents dehydration. Slice an onion: Before you go to bed cut an onion into quarters and put it on a plate at your bedside. The strong odour of the onion helps to break up the mucus and purifies the air. Some people swear by putting a sliced up onion in their socks, but each to their own. As you sleep, the healing powers of the onion remove the toxins in your body. Gargle: When you’re having a sore throat, try gargling with warm salt water. Salt water helps to kill the bacteria in the throat and soothes a sore throat. Dissolve 1\2 teaspoon of salt in a glass of warm water (just remember not to swallow it!) Putting honey in your tea is another great way of soothing the throat. Take a steamy shower: The steam of the shower helps to open up your sinus passages. Eucalyptus oil: Using a few drops of eucalyptus oil is another great way of opening up the sinuses. So remember: wash your hands, stock up on chicken soup and get moving! What do you do when you’ve got a case of the sniffles?